In our home, giving and receiving gifts during the holiday season is a very exciting time. Sure, the kids are excited if they get a video game or toy that they were hoping for and there are even times when they are even glad to see some new clothes and sneakers to show off at school. But with both of them participating in youth football, whether its tackle or flag, there is also an excitement if they open up a gift that will get them ready for the next season. Here are eight holiday gift possibilities for your child or any other youth football player that may be on your shopping list. 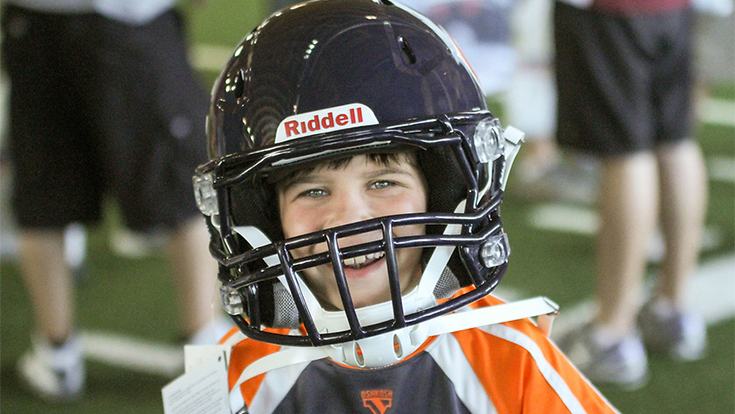 8 – Helmet: Although most youth football programs provide helmets for the players, it’s always a good idea for a parent to think about an upgrade. You might not be happy with the helmet that is given to your child so perhaps upgrading your child to a better helmet is a great gift idea. Budgets can vary depending on the family so research the various brands and models and see what the best fit for you is. 7 – Shoulder Pads: These can be another issue among youth football parents. I can tell you that there was a point when Bradley was given a pair of shoulder pads by his youth football program that were pretty old and also didn’t fit right. So I bought him a new set and that season he was the proud owner of his own set of shoulder pads. If there are two things, at least from my experience, kids can complain about in terms of fit and being comfortable wearing helmets and shoulder pads. 6 – Mouthguards: This is a great stocking stuffer as well as an affordable gift that can provide some additional safety for a child. While programs give out mouthguards, it’s always a smart idea to make sure a child has an upgrade in that area. You can purchase a quality mouthguard for as little as $10 and if you want to splurge you can spend $20 or more on an important piece of equipment. 5 – Equipment bag: How many times has your child or another child on the team shown up for a game or practice carrying gear or even you or another parent is carrying football equipment? It happens all the time. A great gift idea is an equipment bag that is big enough for a child to fit a helmet, shoulder pads, cleats (if you don’t want the kids wearing them in your car) and other accessories. Let the athletic and tough football players carry their own gear in an easy and neat way. 4 – Cleats: The new football season is still eight or nine months away, but now may be a good time to find a new pair of cleats for next season. Many stores might have sales on cleats that were popular this past season. If your child isn’t concerned about having the newest models, see if you can find a pair and put them away for next season. Really good cleats can get pricey so look around and see if you can get a good deal now. 3 – Accessories: If your kids are like my kids, then accessories are a very important part of the fashion portion of youth football. Whether it’s arm sleeves, wristbands, a towel (especially if your child is a center and wants to keep that ball dry in the rain) or even a better chin strap for the helmet, accessories can make a nice gift for a youth football player. 2 – Gift certificate for a sporting goods store: Not sure what to get the youth football player in your life? Then just go to a sporting good store and get a gift card that the child could use for whatever he or she needs. The gift card could also be saved for closer to the season when you know what the program is providing and what they’re not. 1 – Football: What could be more perfect for a youth football player during the holiday season than a new football? I mean how excited would he or she be to open up that box, see the football and head outside to play? It’s so simple but really a great gift idea and it fits into just about anybody’s budget. If you live in a cold weather city, snow should be coming, or maybe it already has arrived. The kids are going to want to have fun in the snow and they can play that day. And there you have it. Some gift ideas that would make any youth football player even happier this holiday season. It may be a while until they hit the field again but having some new football gear should definitely put a smile in their faces.